The deepsea cat shark doesn’t meow and the dogfish won’t bark, but this resident of the Atlantic lives up to its name: even underwater its distinctive blue skin is easily recognizable. 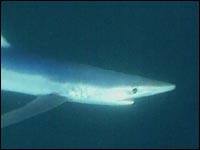 Known scientifically as Prionace glauca, the blue shark is long and slender with a pointed snout. 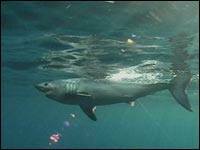 It’s a fast swimmer and at 3.8 metres is among some of the larger sharks of the sea. It’s also one of the most prolific. In a single litter, female sharks may bear 25 to 50 live pups, each up to half-a-metre long, and they give birth after nine to 12 months gestation. 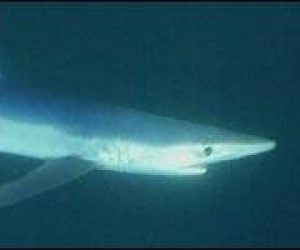 The blue shark’s teeth are pointed and serrated, suited for catching slippery prey such as squid and pelagic (not bottom-dwelling) fish. Known scientifically as Lamna nasus, the porbeagle shark has an uncommon name which is a composite of its looks, resembling a porpose, and personality, resembling the tenacity of a beagle. Common on both sides of the Atlantic, the porbeagle feeds mainly on pelagic fishes such as herring, lancetfish and mackerel. It’s a large, stout shark, reaching 3.7 metres and, underwater, can resemble the mako or great white sharks. If you get close enough though, the porbeagle is set apart by the white patch on the trailing edge of its first dorsal fin, and by the dentricles (small points) found on the sides of its main teeth. Unlike some sharks, the porbeagle has similar teeth on both its upper and lower jaws. A warm-blooded fish with one of the highest body temperatures recorded in sharks, the salmon shark is a fast-moving, energetic fish. It moves quickly and easily through the water and even leaps above the surface while chasing its prey, most commonly the salmon for which it is named. 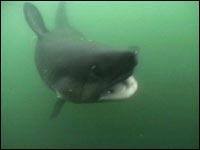 A relative of the porbeagle, the salmon shark’s scientific name is Lamna ditropis. It ranges throughout the Pacific, from Russia and Japan in the west to the North American coast in the east. Little is known about its life cycle in the U.S. and Canadian waters. A handful of researchers are trying to correct that. Read the story in Help from an accidental fishery. The bluntnosed sixgill is a seasonal resident of British Columbia waters. Usually this slow-moving, graceful shark is a deep-sea swimmer, living at depths reaching 2500 metres or 8000 feet. At that depth, these broad-bodied fish are inaccessible to humans, but in the shallower water off B.C.’s Hornby Island the big sharks are fairly easily observed. The sixgill, Hexanchus griseus, has six gill slits where most modern sharks have five. On the shark family tree, it’s thought to be an early member of the same branch which now contains dogfish and sevengill sharks. From the fossil record, it is believed this branch separated from the rest of today’s sharks about 200 million years ago. Find out more about this shark’s family tree in Living fossils. Historically hunted in Norway, Iceland and Greenland for its liver oil, this cold water shark is no longer the target of a commercial fishery, but even when researchers go fishing for Greenland sharks, they’re notoriously hard to find. With the Latin name Somniosus microcephalus, the Greenland shark is also called the sleeper shark and the gurry shark. Animals are usually between 4 and 5 metres, but they can get even bigger. 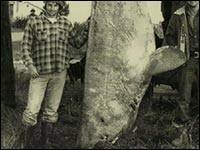 The largest recorded Greenland shark was 6.4 m long. Most specimens seen by researchers are caught accidentally by Inuit ice fishers targeting turbot. The fish has a stony appearance and is slow moving, like the sixgill. It has small eyes which are infected by parasites, rendering the shark nearly blind. These are just a few of nearly 20 species of shark swimming in Canadian waters. Want to read more about Canada’s large predators of the sea? Check out the Canadian Shark Research Laboratory.